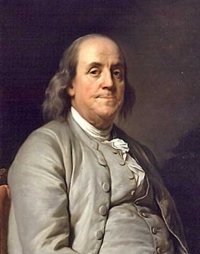 Read these inspirational Quotes by Benjamin Franklin and find out how this great Revolutionary War Hero thought about many important issues. These Ben Franklin Quotes are from his own speeches, letters and writings. Listed chronologically with links to more at the bottom. If you would like to learn more about Benjamin Franklin, check out our Facts about Benjamin Franklin page. "I had been religiously educated as a Presbyterian; and though some of the dogmas of that persuasion, such as the eternal decrees of God, election, reprobation, etc., appeared to me unintelligible, others doubtful, and I early absented myself from the public assemblies of the sect, Sunday being my studying day, I was never without religious principles. I never doubted, for instance, the existence of the Deity; that he made the world, and governed it by his Providence; that the most acceptable service of God was the doing good to man; that our souls are immortal; and that all crime will be punished, and virtue rewarded, either here or hereafter. These I esteemed the essentials of every religion; and, being to be found in all the religions we had in our country, I respected them all, though with different degrees of respect, as I found them more or less mixed with other articles, which without any tendency to inspire, promote, or co nfirm morality, served principally to divide us, and make us unfriendly to one another. This respect of all... induced me to avoid all discourse that might tend to lessen the good opinion another might have of his own religion; and as our province increased in people, and new places of worship were continually wanted, and generally erected by voluntary contribution, my mite for such propose, whatever might bane the sect, was never refused. We have lots more Quotes by Benjamin Franklin for you!